PE licensure is the engineering profession's highest standard of competence, a symbol of achievement and assurance of quality. 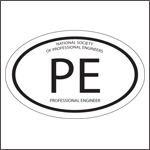 NSPE provides its members, whether already licensed or soon-to-be licensed, with the information and resources they need to earn and maintain the respected PE seal. NSPE does not license PEs. Licensing authority and requirements for PEs falls under the jurisdiction of the licensing board for the state, district, or country in which an engineer practices. The national organization that represents the state boards is the National Council of Examiners for Engineering and Surveying (NCEES). The first step to being licensed in the US is credential evaluation and then determining which state you wish to be licensed in, because US licensure is done on a state by state basis. Learn more.